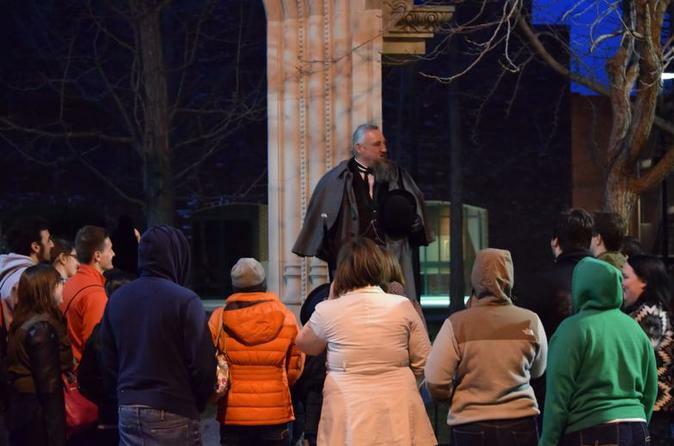 Discover the darker history, ghost stories and legends that still haunt Downtown Boston on this 1.5-hour walking tour at night. Explore some of the darkest parts of Boston's history and the paranormal activity that we capture on film and in person nightly. Meet your guide at 8pm on the corner of Congress Street and State Street in front of the Bank Of America to begin your journey to the most haunted locations in Downtown Boston through a route that is bound to entertain even the most skeptical travelers. Learn about the the darkest parts of Boston's history including the Boston Strangler, Boston Massacre, and many famous deaths and ghost stories in the city's past as we follow the path of these iconic events. Bring your camera because we have been known to capture some really great paranormal photographs. The tour takes approximately 90 minutes to complete but we never rush our guests. The pace of our tours are fully dependent on the walking speed of our guests so some tours have been known to take up to 2 hours.